U.S.S. 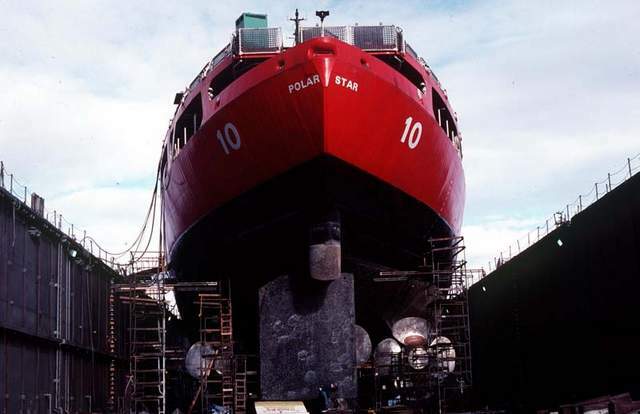 Polar Star awaiting repairs in drydock in Seattle, WA. Photo: U.S. Coast Guard. In mid November, U.S. Senators Mark Begich (D-AK) and Maria Cantwell (D-WA) introduced an amendment into the National Defense Authorization Act cosponsored by Senators Lisa Murkowski (R-AK) and Patty Murray (D-WA) that would authorize spending on up to four icebreakers. While a total of four icebreakers would cost approximately $3.207 billion in 2008 dollars , the per-ship amount of about $802 million is small compared to the cost of an amphibious assault ship ($3 billion) or aircraft carrier ($11 billion). The Navy would contract the construction of the icebreakers, which would then be turned over to the U.S. Coast Guard. The USS Healy, the only icebreaker that the U.S. has in service at the moment, was in fact similarly funded by the defense budget and then given over to the Coast Guard. Neither Hagel nor the strategy, however, mention the construction of new icebreakers. In fact, Hagel said, “DoD will use existing capabilities to help address safety-related challenges, including international search-and-rescue missions as well as incident and disaster response.” The U.S. Navy has no icebreaking capabilities, as that is solely the responsibility of the U.S. Coast Guard. Of course, the Navy and other agencies such as the National Science Foundation would still benefit from expanded icebreaking capabilities. But in general, the DOD appears to be a stronger advocate of cooperation than of increasing national capabilities in the Arctic. Recalling the idea of the frontier, Hagel intoned that the Arctic “is the first new frontier of nautical exploration … since the days of Ericsson, Columbus, and Magellan, and it provides a clear opportunity to work together … to ensure we have accurate observations, maps, and models of the Arctic’s atmospheric, oceanic, and sea ice conditions.” Yet as a military frontier, the Arctic is not the Pacific Ocean or even the Caribbean Sea, both places where the U.S. tries to exert dominance in what it sees as its sphere of influence. In the Pacific, for instance, Vice President Biden met with Prime Minister Shinzo Abe in Japan, just days after China’s institution of a new air defense identification zone, expressing, “We, the United States, are deeply concerned by the attempt to unilaterally change the status quo in the East China Sea.” The Pacific warrants rapid attention from American politicians and military officials alike. By contrast, these same officials are not nearly as concerned by developments in the maritime Arctic. The DOD is instead content to rely on multilateral solutions for the time being despite the objections of the Coast Guard and Alaskan representatives. Senators Begich and Murkowski have staunchly advocated increasing U.S. Arctic capabilities for years, particularly in the way of building more icebreakers. Though farther south, Washington also has an interest in increasing polar capabilities because it stands to benefit economically. As Cantwell stated, “Icebreakers protect America’s Arctic interests and support Washington state shipbuilding jobs.” In 1976, Seattle’s Lockheed Shipbuilding and Construction built the country’s only two heavy icebreakers, USS Polar Sea (currently inactive in Seattle) and USS Polar Star, which will soon re-enter service for another seven to ten years after years of renovations. Yet another Washington-based company, Vigor Industrial, is responsible for servicing and maintaining the three icebreakers in the American fleet. But when consideration of the defense bill resumes next Monday, the senators from Alaska and Washington will likely be left sidelined as others in Congress scratch their heads wondering why billions need to be spent on icebreakers.